Although the Seaside School Half Marathon & 5K is less than a month away, it’s been sold out for quite sometime now. There’s a ton of hard work involved with getting the word out about our event and many have been extremely helpful with the heavy lifting. One of the heavy lifters, and one of our valued sponsors, is Emerald Coast Magazine. Centered out of a once sleepy little fishing village, just a few miles down the road from us, Emerald Coast Magazine is a bi-monthly publication that focuses on capturing the lifestyle of the Emerald Coast, one compelling story at a time. Their magazine has become a valuable communication link in the region that connects people and events (hence the heavy lifting). 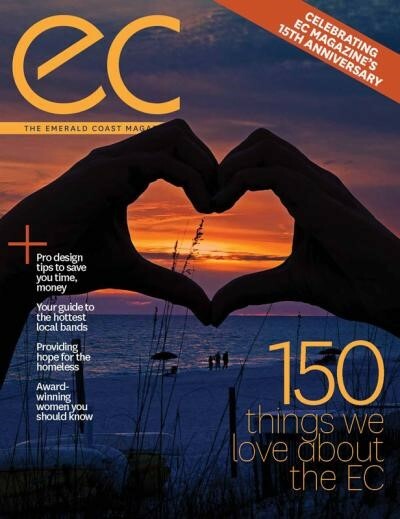 Covering events, local businesses, and the people that call our coast home, Emerald Coast Magazine has excelled in providing relevant quality content. Their outstanding success with keeping people informed has helped heighten the local sense of community and enhances the sense of pride in the place we choose to live and work. It’s no wonder why Emerald Coast Magazine has triumphed as a regional print publication. It’s just one of the many community magazines produced by powerhouse Rowland Publishing, INC. For the past decade-and-a-half this Tallahassee based company has shaped a range of attractive and high-quality community publications spanning throughout Northwest Florida. Although they are involved in countless projects, their proprietary publications are Tallahassee Magazine, 850, Tallahassee Newcomer Guide, and the Tallahassee Business Journal. In addition to providing their own titles, Rowland Publishing produces full service turnkey publications for many organizations including a few for our neighbors at Sandestin with Sandestin Living and the Hilton’s Footprints. We’d like to thank everyone involved with the incredible task of selling out our race so swiftly. If you are one of the many who missed your chance to register for the run, you’ll be happy to know we added an all-new event this year. Chances are you’ve already heard and have your tickets, but just in case, Taste of the Race will be held two days before the run on Friday, February 27th. A stand-alone event, this extravaganza will offer cuisine from nearly 20 of the Gulf Coast’s Top Chefs & Restaurants including Celebrity Chef Emeril Lagasse. Taking place under climate controlled tents at the Seaside Lyceum, Taste of the Race is sure to quickly become one of the best events on the Emerald Coast. Additional offerings at this event will include beverages poured by Grayton Beer, Wine World, and Coca-Cola. A live performance from Trick Pony. Tickets are available for only $99. You can purchase your tickets here. We hope to see you there!